Most developing countries end up as casualties when one examines the travesties inflicted upon them by huge corporations and ruthless organizations such as the IMF, IADB, and WTO. However, Jamaica is a country that has an international voice and is routinely visited by tourists, making it the perfect paradigm to show the disparity between the “haves and have-nots.” Stephanie Black’s incredible documentary, “Life and Debt,” initially is seen through the eyes of a tourist in Jamaica (with an effective voiceover excerpted from a Jamaica Kincaid novel), to show audiences that Western perceptions about the Land of Wood and Water differ from its harsh realities. This tactic helps contrast the opulence and freedom that Jamaican tourists are accustomed to with the poverty, dilapidation, and frustration that has become a fact of Jamaican life. Black depicts visitors engaging in poolside beer-guzzling and volleyball contests as frequently as she portrays locals who long to escape their everyday existence and who often see more luxury pop out of one guests’ suitcase than they would find in their entire neighborhood. We learn quickly that the “tourist Jamaica” and the “local Jamaica” are completely different beasts. Former Prime Minister Michael Manley explains how Jamaica’s borrowing from the IMF put the island at its mercy, creating a new, post-colonial economic slavery where the island ceded all control to the will of foreign economies. Black interviews people who would normally be pillars of Jamaica’s own economy, had foreign corporate competition and IMF snares not wiped them out. We hear proud farmers articulate how their crops became valueless when the well funded and U.S.-supported Dole and Chiquita companies pushed to capture the Caribbean market. U.S. demands for a free market allowed foreign, chemical-laden fruit to sell cheaper than local, organic produce. Many suffer just so these omnipotent corporations can control an extra few percentage points of the produce market. The film points out that most tourists have no idea that the fruits and food at their hotel come from Miami, not Jamaica. The scene of a dairy farmer painstakingly collecting his milk brings the viewer back to how communities exist for centuries. The image of him emptying gallons of fresh milk because of the invasion of cheaper, powdered milk is enough to break one’s heart in a country where many have nothing to eat. Similarly, the garment workers in Kingston’s Free-Trade Zone earn an average of $30 U.S. a week for a six-day work week in torturous conditions. One thing becomes clear through “Life and Debt,” even if we are aware of what is happening, solutions are few. Meanwhile, viewers see the smile on the IMF rep. in the film getting bigger as he reappears. His profit is the poor’s destruction, and it is easy to tell he could not care less. Black shows particular strength in placing the viewer behind the eyes of her subjects, leading us to understand a complicated situation through emotional testimony rather than analytical narrative or objective observation. The film makes us feel as hopeless and frustrated, as disgusted and angry as the Jamaicans interviewed. It tells us that our humanity and world are at stake and urges us to see what is more important to life than money. Black should be especially commended for her use of music throughout the film. 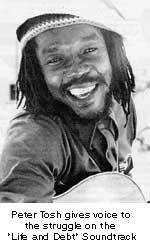 Bob Marley and Peter Tosh, Anthony B. and Sizzla, among others, all help give voice to the struggle. Many westerners have come to learn about Jamaica and its complexities through the brave and outspoken artists who depict the country’s’ plight. “Life and Debt” opens with Buju Banton walking through a shantytown singing “Destiny” and ends with a similar walk by Yami Bolo. Given the faceless and dominating powers that mercilessly enslave the massive, these artists and their messages stand out as the public’s voice, defiant in the face of some very real threats. In the U.S., we hear the message of dancehall and reggae and are aware of problems, but hearing the songs against scenes of rioting, looting, violence, and people living in garbage dumps really clarifies how brave these reggae artists are to speak out. Music emerges as the most powerful, enlightening, pertinent and profitable tool against globalization and the problems in Jamaica so far. Similarly, the Nyahbinghi ceremony captured on the film depicts the Rastafari and their philosophy as truly understanding the big picture of what is going on. Eloquently reciting Bible passages and breaking down the problems of foreign economic invasion, these Rastafari portray the self-esteem that so many have lost. Their self-awareness, clarity of vision, and pride seem to free them from the hopelessness that have ensnared many others we see in the film. Their rebel consciousness provides an alternative to the yoke put on by globalization. They abhor the Western system of putting money lust over the preservation of a healthy life, over community, and over treatment of our fellow man. Like WTO protestors, they will not accept globalization with bowed heads. Black gives a detailed picture of the complexities of Jamaican economics but avoids a complete picture by staying away from the Island’s corrupt political and gang issues. In addition, some explanation of Jamaica’s tourist industry and how the money there often stays in foreign hands with little or no trickle down would have been helpful. The economics of Jamaica’s drug trade and music industry as well would have completed the picture. The film’s message would gain a wider audience if some of the scenes were subtitled. The sound in the theater wasn’t particularly good, making it difficult to understand every person through his or her accent. However, what we are offered goes a long way towards showing both the evils of globalization as well as a deep look into the Jamaica we rarely see or if we do, rarely comprehend. 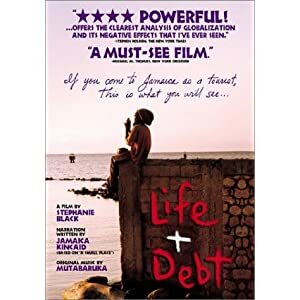 “Life and Debt”(www.lifeanddebt.org) airs on PBS on August 21, 2001. Check your local TV listings for times.